Emergency laparotomy is considered as a high-risk procedure with significant postoperative morbidity and mortality. Despite being one of the most commonly performed emergency surgical procedures, there is a scarcity of data on the outcomes and postoperative mortality rates of emergency laparotomy. This study aimed at creating data on survival pattern and various factors influencing mortality in patients who underwent emergency laparotomy in the department of general surgery of a tertiary care teaching hospital in Karnataka, India. A descriptive retrospective study was conducted among 151 patients those who underwent emergency laparotomy in the Department of General Surgery, Mysore Medical College and Research Institute, over a period of 8 months (January 01, 2016 – August 31, 2016). Data were collected from the medical records available in the Medical Records Library. The study was approved by the Institutional Ethics Committee. Clinical variables including gender, age, time of delay in surgery, pulse rate at admission, blood pressure at admission, data regarding blood transfusion, preoperative comorbidities such as diabetes and hypertension, history of addictions, postoperative albumin on day 1, and data regarding mortality and immediate medical and surgical complications were reviewed from medical records. 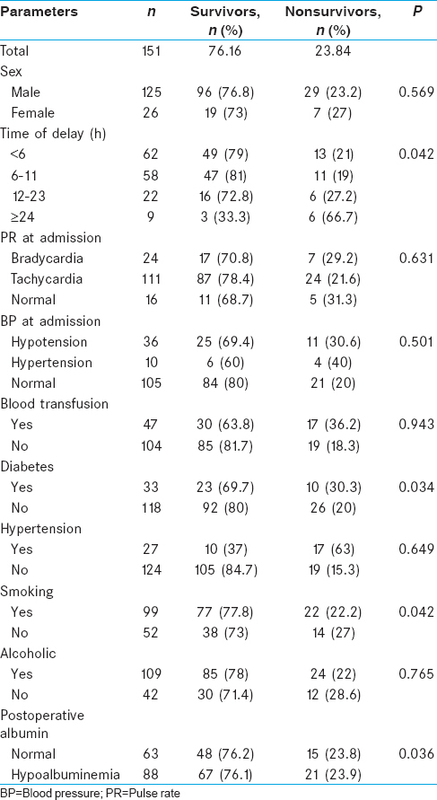 Thirty-day postoperative mortality was considered as the primary outcome. Statistical analysis was performed using Epi info version 7 Centers for Disease Control and Prevention (CDC) (Atlanta, Georgia, US). Frequency and percentage were calculated and Chi-square test was used to compare the variables between survivors and nonsurvivors. P < 0.05 was considered statistically significant. The study was conducted among 151 patients who had emergency laparotomy over a period of 8 months. The mean age of the study population was 45 years, with 82.8% being males. Age distribution of the study population is depicted in [Figure 1]. Basic parameters and its distribution among survivors and nonsurvivors are shown in [Table 1]. Distribution of patients based on diagnosis is shown in [Table 2]. Sixty-one percentage of the study population had hollow viscus perforation. Age of the patient, time of delay, and postoperative albumin level showed statistically significant relation to the survival. The overall 30-day mortality was found to be 23.84% (36/151). Emergency laparotomy is one of the most common procedures in surgical department and is associated with significant mortality rates ranging from 14% to 20%., It has been reported that advanced age increases the mortality rate to more than 50%. In our study population, 18.5% were in the age group of more than 60 years. The overall 30-day mortality rate was 23.84% (36/151). Of this, 50% were belonged to 30–50 years' age group. One-third of the patients aged above 70 years succumbed to their illness. Older age is associated with a reduced function of multiple organs and an increased prevalence of comorbidities which itself are associated with a deterioration in postoperative morbidity and mortality. The cause of death was documented as death due to medical complication in 76% of cases, death due to surgical complications in 22%, and combined in 4%. The overall mortality in our study was higher compared with that reported in the literature. This reaffirms the need for an optimized pattern of care in patients undergoing emergency laparotomy including multidisciplinary care to tackle immediate postoperative complications. It has been reported that perioperative blood transfusion has associated with a poor prognostic value in terms of postoperative outcome. We could not find any significant association between perioperative blood transfusion and poor outcome, maybe due to the smaller sample size of the current study. There are few limitations for this study. Since it is a retrospective case record-based study, we could not study all the parameters that can influence the outcome. However, the results of this study demand further detailed research on factors influencing the postoperative outcome and also the need for proper institutional guidelines for the management of postoperative patients with a multidisciplinary team including critical care intensivists, physicians, nutritionists, and physiotherapists. Emergency laparotomy carries a high mortality and is associated with several modifiable factors. The fundamental objective was an evidence-based identification of the factors determining survival and pattern of survival after emergency laparotomy. The data presented here reinforce the need for new models of care with increased multidisciplinary input into the patient care in the postoperative period. The data of this article have been presented in ASICON 2016-National Conference of Association of Surgeons of India, 2016, Mysore, Karnataka, India. Clarke A, Murdoch H, Thomas MJ, Cook TM, Peden CJ. Mortality and postoperative care after emergency laparotomy. Eur J Anaesthesiol 2011;28:16-9. Saunders DI, Murray D, Pichel AC, Varley S, Peden CJ, UK Emergency Laparotomy Network. et al. Variations in mortality after emergency laparotomy: The first report of the UK emergency laparotomy network. Br J Anaesth 2012;109:368-75. Pearse RM, Harrison DA, James P, Watson D, Hinds C, Rhodes A, et al. Identification and characterisation of the high-risk surgical population in the United Kingdom. Crit Care 2006;10:R81. Matsuyama T, Iranami H, Fujii K, Inoue M, Nakagawa R, Kawashima K, et al. Risk factors for postoperative mortality and morbidities in emergency surgeries. J Anesth 2013;27:838-43. Bose AK, Aitchison JD, Dark JH. Aortic valve replacement in octogenarians. J Cardiothorac Surg 2007;2:33. Gibbs J, Cull W, Henderson W, Daley J, Hur K, Khuri SF, et al. Preoperative serum albumin level as a predictor of operative mortality and morbidity: Results from the national VA surgical risk study. Arch Surg 1999;134:36-42. Detsky AS, Baker JP, O'Rourke K, Johnston N, Whitwell J, Mendelson RA, et al. Predicting nutrition-associated complications for patients undergoing gastrointestinal surgery. JPEN J Parenter Enteral Nutr 1987;11:440-6. Mullen JL, Gertner MH, Buzby GP, Goodhart GL, Rosato EF. Implications of malnutrition in the surgical patient. Arch Surg 1979;114:121-5. Blackburn GL, Harvey KB. Prognostic strength of nutritional assessment. Prog Clin Biol Res 1981;77:689-97. Mynster T, Christensen IJ, Moesgaard F, Nielsen HJ. Effects of the combination of blood transfusion and postoperative infectious complications on prognosis after surgery for colorectal cancer. Danish RANX05 colorectal cancer study group. Br J Surg 2000;87:1553-62. Møller AM, Villebro N, Pedersen T, Tønnesen H. Effect of preoperative smoking intervention on postoperative complications: A randomised clinical trial. Lancet 2002;359:114-7. Theadom A, Cropley M. Effects of preoperative smoking cessation on the incidence and risk of intraoperative and postoperative complications in adult smokers: A systematic review. Tob Control 2006;15:352-8. Alves A, Panis Y, Mathieu P, Mantion G, Kwiatkowski F, Slim K, et al. Postoperative mortality and morbidity in French patients undergoing colorectal surgery: Results of a prospective multicenter study. Arch Surg 2005;140:278-83, discussion 284.